The latest in my long running series of publications of previously unpublished or rare memoirs of the Napoleonic Wars is a little out of the ordinary. For the memories of Conductor George Augustus Aynge are set entirely in verse! Aynge was an avid proponent of poetry, if not particularly gifted, but he did publish two of these works, these were Ayete his version of his time in the Carlist War and The Death of Tecumesceh: and poetical fragments on various subjects although it is clear that they did not make his fortune. However he wrote a great deal more poetry, including Allegro, which appears to describe his period of service with the Duke of Wellington’s Army in the Peninsular War and at the rear of Tecumesceh there are to be found a few short poems he wrote during periods of sick leave in England. These form the basis of this present work. I say his version, because although his story in verse has the ring of truth in many respects, as he includes a correct knowledge of the movements of the army during the periods mentioned, he has an eye for the detail of army life and makes very limited claims for himself to any distinctive service. However, from the extensive research carried out on his career by his descendants Katharine Carlton, Nigel Walker and Colin Warburton, who kindly brought these poems to my attention. It has proven extremely difficult to marry up a number of the facts disclosed about his career in the records against his claims in the poems. This is not to say, they are not basically true, but there are some questions over parts of his version of events, at least. 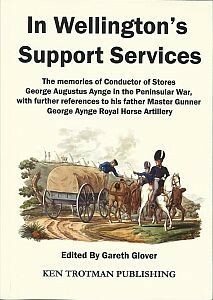 This confusion is certainly not helped by the fact that his father was also called George Aynge and served in the Royal Artillery, whereas our George Augustus Aynge served as a Conductor which was attached to the Ordnance Department, but also part of the Royal Artillery. Both also appear to have served under a Captain Alexander Macdonald; however it would seem that they did not serve under the same Alexander Macdonald, there being two in the Royal Horse Artillery at this time! One can readily see that the opportunities for confusion and misidentification of the correct Aynge or Macdonald have caused infinite pain in attempts to unravel their individual stories. However, the following precise of their lives is the best that can be established with any certainty from the official records. I have also highlighted areas of confusion that still remain regarding certain claims made that have yet to be reconciled by documentary evidence.